Most benefits will run out before the end of the month--and some have already been cut. Forget conservative fantasies of food stamp beneficiaries living high on the public dole and feasting on king crab legs—life on food stamps is anything but luxurious. That’s worth reflecting on during this Thanksgiving week—a holiday known almost exclusively for its food, and one that always falls during the last week of the month. Having anything resembling a proper Thanksgiving meal on $4.44 per person is already basically impossible, and most beneficiaries are over-budget by this point anyhow. 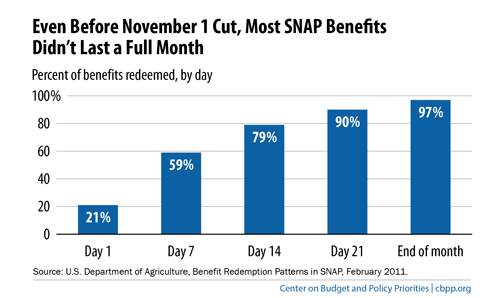 Remember, too, that on November 1 food stamp benefits were reduced thanks to indifference by both Democrats and Republicans towards the already paltry benefit amount. So this Thanksgiving is even tougher than years’ past, and the upcoming winter months will be as well. 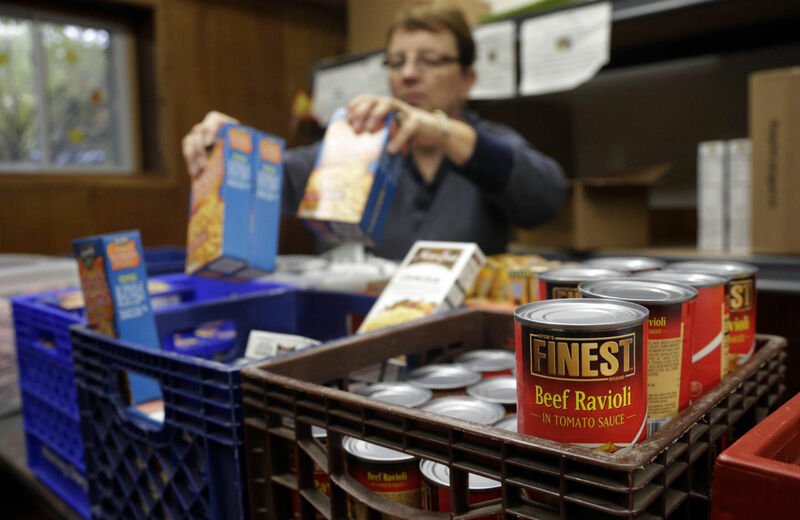 Nonprofits that serve the hungry are buckling under increased demand. The season of feasting has begun. But even as some pore through cookbooks in search of the perfect stuffing, nearly one in eight residents of Massachusetts worry that the food in the cupboard won’t last until the end of the month. The problem is growing and it’s not just in the poorest urban neighborhoods. Hunger exists in every community, including Newton. According to Tracie Longman, the Newton Food Pantry regularly serves over 450 households in Newton, providing food to over 600 people a month. That represents an increase of approximately 25 percent over two years ago. Local pantries and soup kitchens throughout New York were stretched thin even before a cut in federal food stamp benefits took effect Friday. Now, their managers don’t know how they’ll meet the increased demand. A hot meal. That’s what brings people in need to the Salvation Army Soup Kitchen in Watertown. What makes them stay is the conversation. “Being able to eat a meal with someone else, to be able to talk over a meal,” said Lt. Summer Hough of the Salvation Army. But lately a rise in demand has made it tough for the soup kitchen to keep up. “Up until about three months ago, we were serving on average about 80 people in our soup kitchen and in the last couple months it’s actually gone up into the hundreds,” said Hough. The pantry spends $4,000 to $5,000 each week to provide fresh produce, meat, dairy and bread for clients which is supplemented with staples. But there’s less than $20,000 currently in the food pantry account and Scarpaci fears that without major donation dollars coming in soon, the pantry will have to close for at least a few weeks when demand is at its peak. “There have been times before where we’ve gotten low, but never this low,” says Scarpaci, who notes that a fundraising New Year’s Day polar bear plunge at Main Beach in East Hampton will bring in some money for the town’s four pantries, but not nearly enough. The Supplemental Nutrition Assistance Program (SNAP) recipients saw a 13.6 percent cut in benefits beginning the first of November. For a family of four, on what’s still largely called food stamps, the reduction adds up to $36 per month. And fewer federal dollars is starting to have an impact on area food banks. One organizer summed it up—demand the last few weeks is up and donations haven’t kept pace. Now the concern is whether this is a temporary blip as families adjust to the reductions or whether it’s the “new normal” that food pantries will have to meet in the future. Many families still face unemployment or underemployment, said Bonnie Inman, executive director of Loudoun Interfaith Relief. Many people seeking help from the food pantry cited the federal government shutdown as an added financial stress, she said. “The demand for our services has really not decreased at all,” Inman said. That’s just a sampling. And the worst part is the situation isn’t going to get any better—in fact, it’s about to get worse. House Republicans passed a farm bill earlier this year that cut a nearly $40 billion from the program. Senate Democrats’ “better” plan is a cut of $4 billion. The real amount will no doubt be somewhere between those two numbers. Those bare cupboards this holiday season will almost certainly have even less next year. On Black Friday, Walmart employees nationwide will be protesting the retail giants’ poor labor standards. Allison Kilkenny reports.